Separate dough into 8 biscuits. Cut each biscuit into 3 strips. Press each piece into 4x1 1/2-inch rectangle. Fold and place 1 piece ham, 1 piece turkey and 1 piece cheese on half of each rectangle. 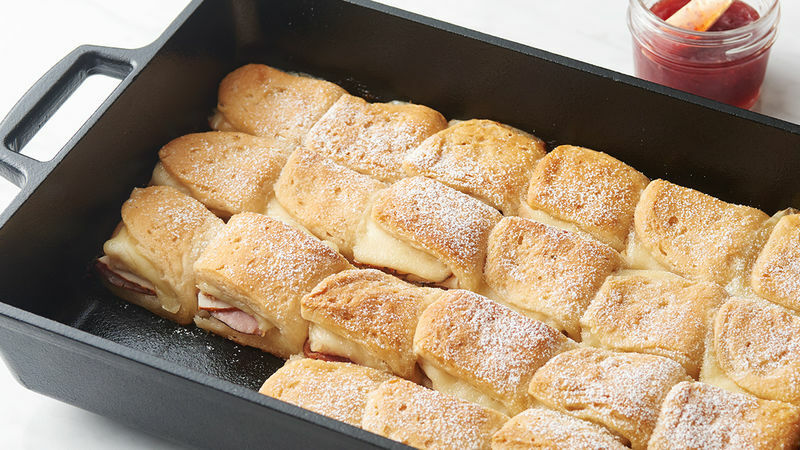 Fold dough over ham, turkey and cheese (do not seal); place in baking dish in 6 rows by 4 rows. In small bowl, mix melted butter and maple syrup. Brush biscuits with butter mixture. Bake 30 to 35 minutes or until biscuits are cooked through and deep golden brown on top. Sprinkle with powdered sugar; serve with jam. For a pretty presentation, place jam in microwavable bowl, and microwave uncovered on High 10 to 15 seconds or until warm enough to beat easily with whisk, then drizzle over cooked biscuits after sprinkling with powdered sugar. Experiment with different flavors by using your favorite deli meats and sliced cheeses.